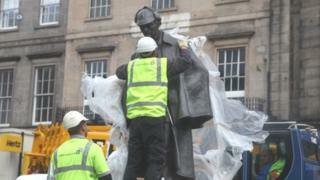 A statue of Sherlock Holmes has been reinstated three years after it was removed to make way for tram works. The bronze statue was put into storage because its site in Picardy Place, at the top of Edinburgh's Leith Walk, was directly in the path of the project. Arthur Conan Doyle, who created Sherlock Holmes, was born in Picardy Place in 1859. The statue was erected by the Federation of Master Builders to mark its 50th anniversary. Lesley Hinds, Edinburgh City Council's transport convener, said: "Commissioned to mark the birthplace of his creator Arthur Conan Doyle, the magnificent statue of Sherlock Holmes has been a much loved figure on Picardy Place since 1991. "The statue has been carefully conserved and spruced up by experts at Powderhall Bronze and we're delighted to see it back on public display once again."